What separates an average beard from an extraordinary one? Using the best beard brush, that's what. A quality beard brush is perfect for use with your balms and oils and offers superior beard styling and conditioning properties. Once you have your beard cleaned and untangled, a brush is the ultimate tool for putting the finishing touches on a well-groomed beard. The problem is that there are a ton of these brushes out there on the market. In this article, we will take a look at the top 10 beard brushes. 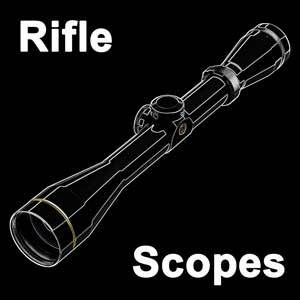 That way you can quickly find the one that is a perfect fit for you and get busy making that beard look amazing. This is part of an overall grooming effort. 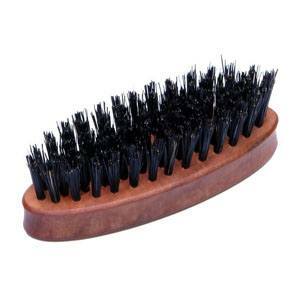 The Zeus brush is made from 100% boar bristles with no synthetic fibers. 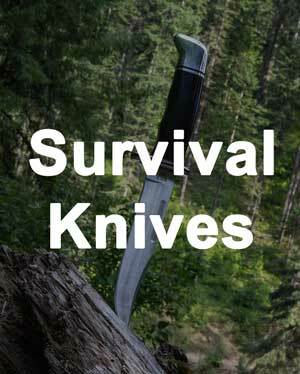 It features three rows of first-cut natural boar fibers that are very firm. Even with firmer bristles, this brush is smooth on the skin and has nice massaging properties. The brush is pocket-sized with a military oval shape made from pear wood. 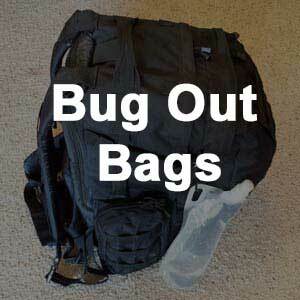 Because of the stiffness of the fibers, it can work out some tangles. This brush makes working in oils and balms a simple task, making it the best boar bristle beard brush. Here we have a brush in the classic oval, military style. 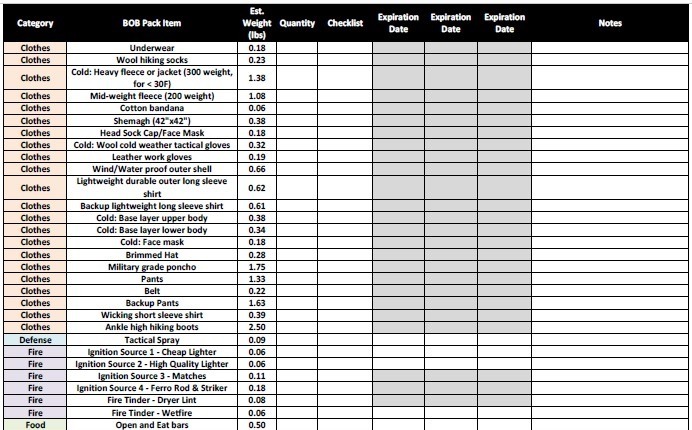 There is a mixture of synthetic fibers and boar's hair with the former being much more prevalent. You get a very stiff brush that is great for untangling hair, but it can be pretty rough on your skin. It is a compact brush at right under 5 inches long. The natural finished wood feels good in your hands for better grip. This is not the most comfortable brush on the list, but it is inexpensive. It is great at working out the tangles of a beard that has not seen a brush in a while. The Smooth Viking is made with 100% natural boar bristles. The bristles could be considered medium stiffness and can work through some beard tangles with minimal discomfort. They are also soft enough so that they feel great on your skin and will not cause irritation or discomfort. 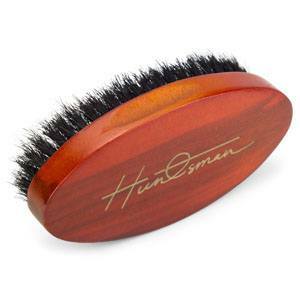 As a compact brush, it fits great in your hands since it features an oval, polished wooden handle. This is a great brush that will clean your beard, remove dandruff and dust particles, and work well with oils and balms. This brush works with any beard type. The Beardman is made from bamboo/beachwood and has an excellent finish and grooving that makes it a pleasure to use. 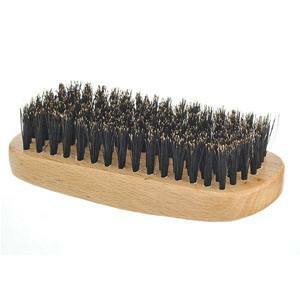 The bristles on this brush are soft natural boar bristles that work in the oil and balm extraordinarily well. Not only is it perfect for styling, but it is also great at conditioning your beard. This brush feels nice on the skin and will not scratch or irritate the skin. 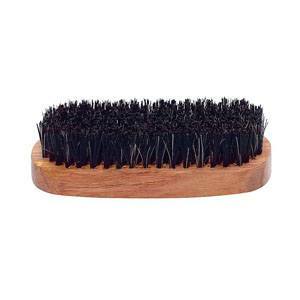 Because of the very soft bristles, the brush does not do well when you need to untangle your beard. Nor does it work well with the addition of product and styling. It works great if you just want a simple brush. Its normal size handle fits in your palm with ease and can be used with just about any sized or style of beard. The Huntsman features natural and very soft boar bristles that are fantastic for styling a more groomed beard. It is also great for adding some beard oils and balms to your beard as it will distribute them evenly throughout the length of the hair down to the roots. The brush has a beautifully polished and finished wood that looks fantastic and feels great in your hands. This is not going to be the best brush for working with unruly beards, but it is a great secondary styling brush that can be used after a good go through with your comb. 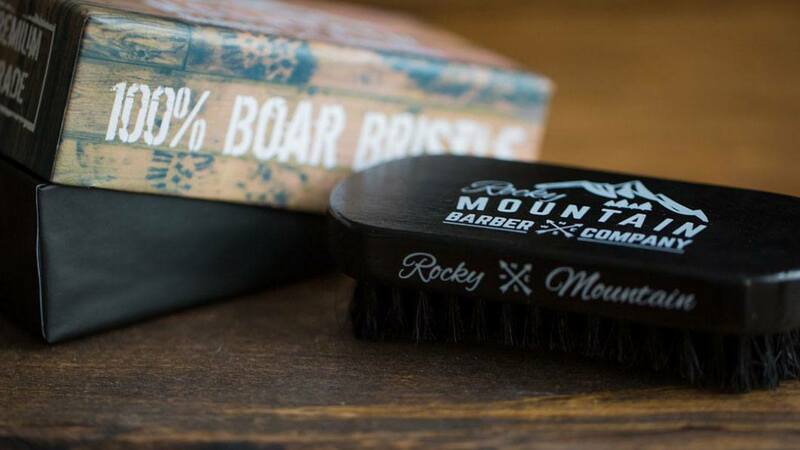 The Rocky Mountain Barber brush is made with all natural boar hair. 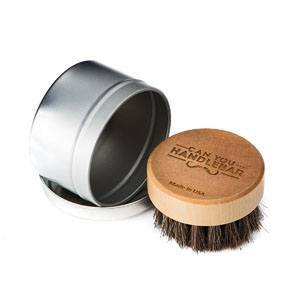 It does wonders conditioning and shaping your beard though it does have shorter fibers than other brushes on our list. Because of the short fibers, this brush may not work as well with extremely long beards. This is a cool looking brush on top of everything else. While some might not care what it looks like as long as it works, we think looks can be important too. The wooden oval handle is sanded with a black finish before going through a good polishing that makes it feel great in your hands. Can you Handlebar is a well-known name in the beard grooming industry. 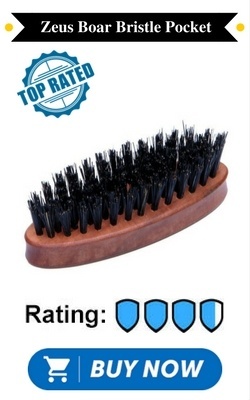 Their travel brush brings all of the quality of their other American made products. This small, compact travel brush looks similar to shoe shine brushes, but it works perfectly for applying oils to condition and soften your beard. 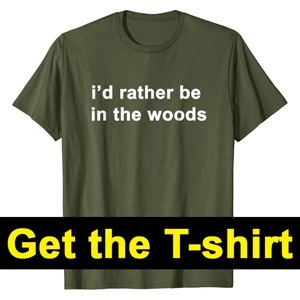 It is made from soft, natural horse hair. While not great for much else besides the application of product, it is a great tool to have in your beard grooming arsenal and works very well with their dry oil as well as other liquid beard oils. This brush from Beard Captain features a classic palm handle design seen in all of our brush choices so far. Crafted from 100% recyclable bamboo, the sides of the wooden handle have grooves cut to give it a much more comfortable hold. 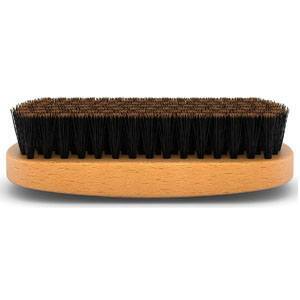 The bristles used in this brush are all natural boar bristles that are reinforced at the entry point to the wood to keep hairs from falling out and giving this brush more longevity. This brush feels great on your skin. 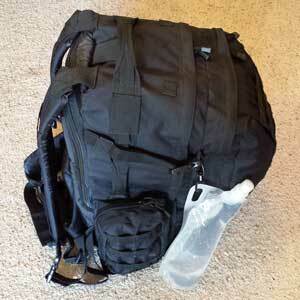 It will not cause irritation with the medium soft fibers. 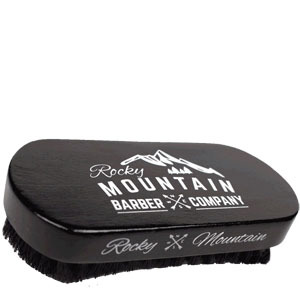 The stiffness level of the fibers make it a very versatile brush that will work well with conditioning and styling your beard as well as function decently at working out beard tangles easily. The Zilber Haar looks more like a traditional brush you commonly see with an extended handle. 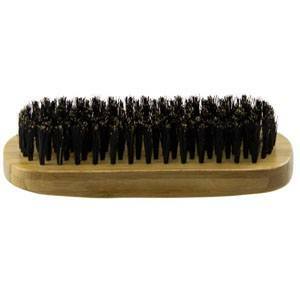 It uses all natural and very firm boar hair fibers for the bristles. 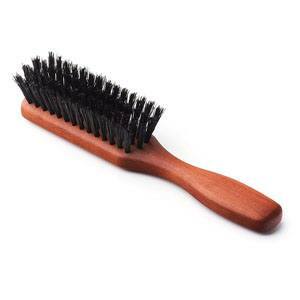 This brush is crafted from pear wood and has a great smooth wooden finish. The unique brush design feels very ergonomic. The brush is great for untangling and getting unkempt beards in line. The design of this brush and stiff fibers make it great for getting through tangles and snares easily without the brush getting snagged. It also does a fantastic job at cleaning out dandruff and other particles from your beard. This brush is handcrafted in Germany, and it is a great versatile brush that will serve you well in your beard grooming kit. 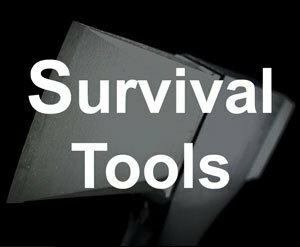 If you also need a comb, then consider this awesome kit. 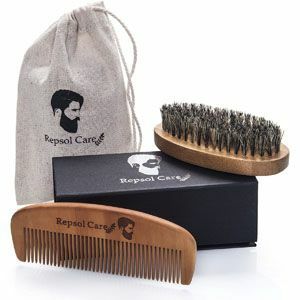 The Repsol Care kit comes with a brush that uses natural and finished wood for its handle and all natural boar bristles. The bristles for this brush are pretty stiff, but they still do a great job at conditioning your beard with oils and balms. What's neat is that the bristles are also longer than most on our list and make it a great option for those with longer beards. If you are a user of beard balms and oils and believe in maintaining a groomed beard, then you must have a quality brush in your collection. You will quickly see the benefits and the superior conditioning properties that brushes provide. If you are confused by the old beard brush vs comb debate, then consider that they both serve a purpose. Beard combs are great at the initial detangling and straightening, while brushes help you fine tune your beard. We have listed the top 10 brushes that we know you will be pleased with and will keep your beard looking healthy, strong, and maintained. Once you use the best brush for beards, you'll see what you have been missing.